This is the last known photograph of the completed painting, taken in 1970.
many of Bagradian's paintings were destroyed by zealots. 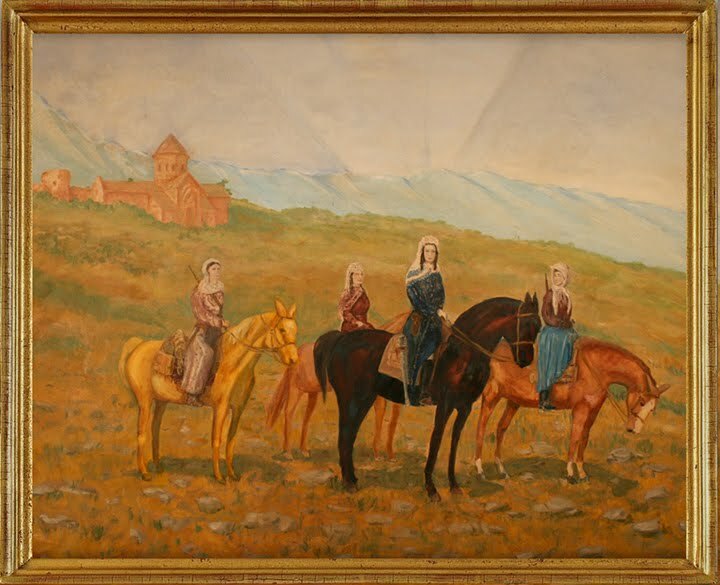 The Bagradian Museum is pleased to present recently discovered paintings of Stephan Bagradian's, documenting the building of the Armenian capital at Ani. Most of these works were severely damaged after iconoclastic mobs looted the state buildings. Long thought to be lost, these paintings date from the end of World War I, when the young Republic of Armenia was awash in frenetic energy, invigorated by the Treaty of Sèvres. Bagradian traveled to the building site of Ani with his easel and sketchbook to capture the dramatic birth of a new Armenian state. At the present time, our conservators have deemed most of the work too damaged to repair given our present budget. Only remaining fragment of "Guardians" this piece was also found in the same place as "Scouting", stuffed under a coal bin in Ani. This is the last known photograph of the completed painting, taken in 1972. A picture from Bagradian’s 1957 retrospective at the Constantinople Guggenheim with “Scouting the Site of the New Capital“ in the background. 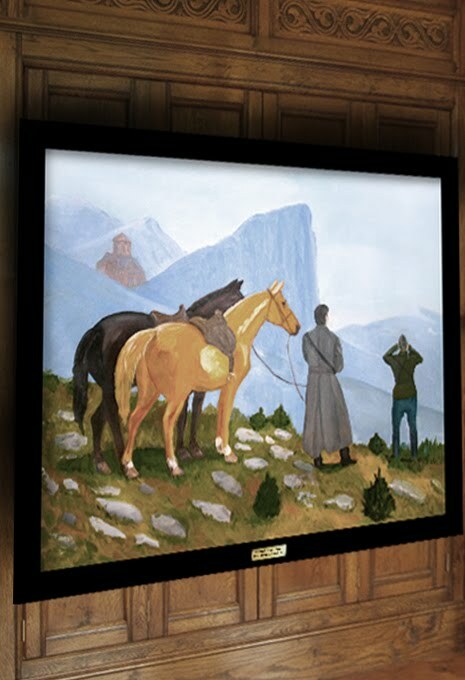 “Scouting the Site of the New Capital“ was one of the paintings found in a 2016 renovation. This is the only segment that survives, it was found under a coal bin. The paintings were found rolled up and stuffed under the coal bin. After a successful seismic and insulation remodel (2016). Bagradian's works of the late 1920s through 1945 are not allowed to be shown in electronic format. We hope to have this cleared up soon. Thank you for your patience. To see his "sellout" works of 1946, click below.